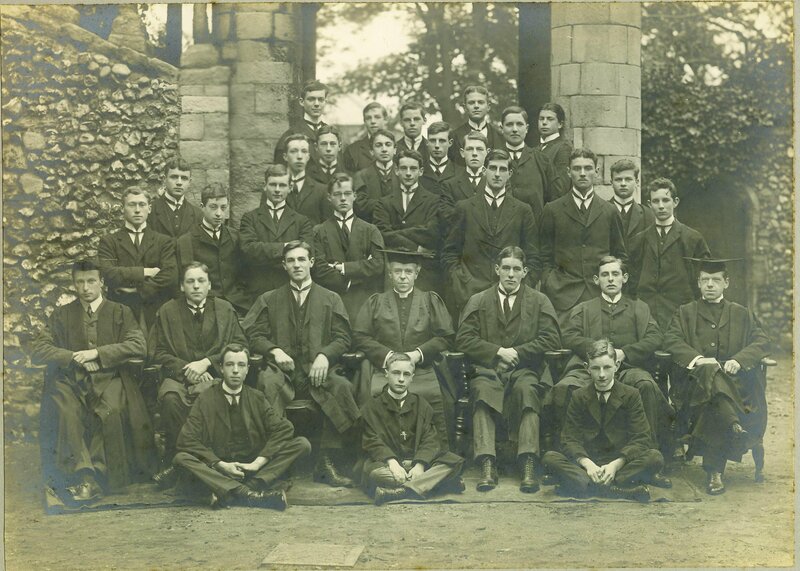 In April 1905, soon after returning from the East, I was appointed Sixth Form Master at King’s School, Canterbury, where I spent seven of the most valuable and happy years of my career. For the first three years I was a resident master, living in the Green Court under the shadow of the Cathedral, and under Dr Galpin I learnt many valuable lessons as to the traditions and conduct of a good English Public School. During this time I wrote a Latin Dissertation on the Apocryphal Gospels for which I was awarded the degree of Bachelor of Divinity at Cambridge. I followed this up by a series of articles for Murray’s Dictionary of the Bible including one on Gnosticism showing how far that fourth-century heresy is foreshadowed in the New Testament. On April 22nd 1908 I was married to Ina Mary Rowson at S Anne’s, Soho, London W.C., and in the delightful house where we lived at Canterbury – Vernon Villa, Vernon Place – my sons, Martin Stewart and Gerald Richard, were born. During this period I had many appreciative letters written to me by the Headmaster, Dr Galpin, with regard to the work I was doing with the scholarship boys in the Sixth Form. But the results of my labours were perhaps best seen in the numerous Open Classical scholarships and exhibitions at Cambridge and Oxford gained by pupils of mine. 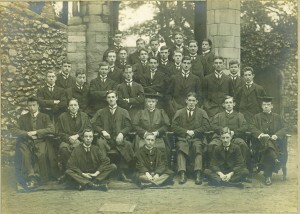 The Sixth Form 1910. RS Moxon is seated at the right. Headmaster Galpin is in the centre. Nor were my ordination vows neglected by me during these three years. From the day I was married to the day I left Canterbury I preached two and very often three or even four sermons a Sunday. Not only did I regularly take duty in the morning at Patrixbourne, a village three miles from Canterbury, and in the evening at Ickham, a village five miles away, but it fell to my lot to preach in School Chapel three times a term and occasionally I was invited to occupy the pulpit in the Cathedral itself. And on the preparation of my sermons I bestowed particular pains and care, for it was my highest ambition to excel as a preacher, as my Uncle had done before me, and this wish was not from any desire for self-glorification, far from it! but because I knew that whatever talent I had in that respect was capable of being vastly improved and that my influence and power of doing good would by that means immeasurably increase. Two years before we left Canterbury I obtained a motor bicycle and side-car which enabled my wife and myself to get about the country a good deal and see much more of the “Garden of England” than would otherwise have been possible. In this we used constantly to visit Margate, Folkestone and other sea-side places on the Kent coast, thus adding very considerably to the pleasure of our holidays. In the year 1910 my Uncle, Canon Johnson, died. He had by this time resigned the living of Clayton-le-Moors and was staying with my brother the Vicar of Alfreton, Derbyshire. There my Aunt continued to live after Canon Johnson’s death. During this period I went abroad several times, visiting Brussels, Lisbon, Madeira and Paris, the latter place chiefly for the purpose of collating some Latin manuscripts of a Theological work by Vincentius written in the fifth century A.D.
On December 4th 1911 I was elected out of 150 applicants to succeed Mr F. H. Chambers as Headmaster of Lincoln School and entered on my new duties in January 1912. Reginald Moxon was Headmaster of Lincoln Grammar School from 1911 to 1929. He was later Vicar of East Cowes, Isle of Wight and then Vicar of All Saints, Ryde. He died in 1950. These autobiographical notes are reproduced by courtesy of the Moxon Society.